I try not to read much when I’m writing because I fear accidental inclusion of someone else’s ideas in my own writing. The last thing I need is to throw myself into editing and find out I’ve incorporated a hobbit or a warrior polar bear into my story line without realizing it. That being said, while I work on edits I’m less likely to incorporate new components into the manuscript, so I read. I’ve been an avid reader all my life, so I take to these opportunities as if the only sustenance that will keep my withered heart beating is book after book after book. Much like everyone else that was not currently in the know, I read The Hunger Games trilogy. I haven’t put much effort into reading other reviews, however, because I have plans to see the movie on Wednesday. Since one wrong Google could lead me to a movie review, I feel safer in waiting until I’ve seen it to see how other readers received the books. For my part, I was initially very put off by the first person, present tense narrative. I get this feeling that someone, somewhere decided this was a good idea and I couldn’t agree less. Even so, I thought the book was very well written, the characters easy to love or hate as required, and the world so easy to envision that I almost suspect our own world tip-toes a fine line with that conjured up version. The second and third books were good and I didn’t find myself liking the characters any more or less than I had, but the change from personal story to epic struggle was less endearing to me. I love a good epic adventure tale, but the stark shift from one life to all lives in balance created a bit of discord in the series for me. Afterward, I tore through Shelley Adina’s first two novels in her Magnificent Devices series. 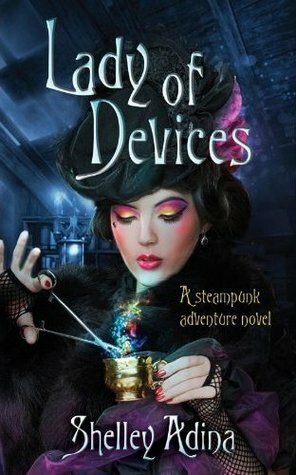 Lady of Devices and Her Own Devices are available now and the third, Magnificent Devices, is expected this year. I found these books to be the best sort of thing to satisfy an afternoon with little else to do. They read very quickly. Unlike the American Steampunk that I’ve been gravitating to more recently, these are unapologetically British. True, the third promises to take place in the Canadas and the States, but most traditional Steampunk fans will be pleased with the class structure, ever-present bustles and corsets, and a power struggle between the Wits (educated class) and Bloods (nobility). If you lean more toward the gritty and dystopian brand of Steampunk, there is an almost cartoonish underworld of crime central to the story. It isn’t exactly believable, but it didn’t diminish what was really just a fun read anyway. All in all, I do not count the time spent reading either series as time wasted. I expect that I will not purchase another NOOKbook until I have completed a short story or two to submit somewhere, but I am thankful for the respite they gave me.